In the last few years the hobby drone market has just exploded. What was once the preserve of filmmakers and those absurd amounts of disposable income is now accessible to everyone. In part that’s thanks for devices like the LiDi L6F hexacopter, currently on sale for $85 at GearBest.com. Most consumer level drones are quadcopters – meaning they have 4 motors driving the blades. The LiDi L6F has, as the name suggests, 6 – making it a hexacopter. While it would be naive to simply say “more blades is better”, in theory you should have a greater degree of control and stability, when compared to a quadcopter of a similar size and weight. You also get slightly less flight time though, since more motors are driven by the same size battery. As it is, the L6F is very lightweight, so manoeuvrability suffers in the presence of any amount of wind, but is still controllable. There’s a 2 megapixel HD camera mounted on the underside, which both transmits video to a 4.3″ screen mounted on the physical remote control, and can record to a micro-SD card (not included). Included in the pack are a couple of spare blades, some optional blade protectors (which I highly recommend you use these while still learning), a USB charging cable, a small screwdriver and spare screws. It also includes an 850mAh battery for the drone, but not the 4 AA batteries required for the controller. 6 LEDs adorn the underside of the device; 4 green, and 2 white, which indicate the forward direction. This is mirrored in the blades, with white blades in front and black blades to the sides and rear. In daytime, I found the blade colors were more useful – you can turn off the LEDs by pushing the small vertical button on the left up, which might save a little battery power. The controller and overall build quality is about what you’d expect from a sub-$300 drone: lightweight, cheapy plastic. It does however appear to be quite durable – I crashed the thing multiple times from heights of 20 meters or more, including getting it stuck up a tree and having to throw large sticks at it to coax it back down to earth. It took a beating, and I haven’t used any of the included replacement blades yet. I did fit the included blade protectors, though. It’s also worth noting that every part of the LiDi L6F (and it’s accompanying L6W, which forgoes the screen in favor of a user’s smartphone) is replaceable, and for entirely reasonable prices. The controller is a standard arrangement of two joysticks; the left adjusts altitude (as well as takeoff) and rotation; while the right strafes and moves backwards and forwards. A shoulder button in the top left enables video, while the right hand side initiates a mid-flip, though I couldn’t get this to work. Another button adjusts speed and allows you to turn off the LEDs, and yet more buttons supposedly fine tune any drift that might occur, though it was unclear to me if they actually had an effect. The initial control problems I faced were fixed by simply recalibrating the device on a stable surface, and ensuring the battery was properly charged. At first, I couldn’t go more than a minute without haphazardly crashing into something. Something just seemed off. It seems that the L6F calibrates itself automatically when it turns on, so you need to flick the switch while placed on a level surface (though you can recalibrate the gyro sensors at any time by moving both joysticks to the bottom left corner). It also seemed unable to properly maintain its height, but again, I traced this to the battery not being full enough: even if your battery was full when being stored away, you’ll need to charge it again before flight, as it tends to lose the charge quickly. Once that was sorted, I was on a level playing field, and quickly picked up maneuverability. Unlike pro-level drones which are happy to be quite hands-off (the latest DJI literally flies itself), the LiDi L6F requires constant attention. It doesn’t have an altitude hold function, so you’ll need to keep your finger on the altitude control stick, and is strongly affected by wind, so you’ll need to correct course for that too. In that sense, it’s actually an ideal learner drone. The specs advertise a return home feature, but it seems to be a little misleading: what it means if that if you’re flying the drone away from you, you can pull back on the right stick to make it return (ie, fly backwards), which is what any drone with that control scheme would do anyway. The camera is just 2 megapixels, but that’s enough for a full HD video. The quality was surprisingly good, however, there’s no stabilization of any kind and I occasionally experienced glitching. If you haven’t yet, watch the review video at the start for lots of sample footage. The video should be considered as primarily for flying FPV (first person view) mode, enabling you to see what the drone sees. You’ll enjoy reviewing the footage later, but clearly this isn’t going to produce good enough footage for real estate agents or budding moviemakers (unless your movie follows the life and times of a budget hexacopter drone that keeps crashing, of course). Oddly, the photo-taking functionality was less reliable, so there’s probably a knack to how long the button needs to be pressed. A long press to initiate the video recording worked fine every time. The 850mAh battery doesn’t go far: around 6 minutes with full video recording. The connector is a little awkward to connect as well, but it’s all standard RC kit. They’re bad at keeping a charge, and will damage if you store them depleted for long periods of time. In practice this means you need to fully charge them before, and at least a 50% charge after flights. With all that said, you can buy additional batteries for $3 each, or even a pack of 5, complete with charger and 5-way power splitter cable, for just $20! To put this in perspective: we only got about 15 minutes from Parrot Bebop Parrot Bebop Drone and Sky Controller Review and Giveaway Parrot Bebop Drone and Sky Controller Review and Giveaway Soar through the sky and see the unseeable with fantastic aerial photos and smooth videos: this is the Bebop Drone and Sky Controller. 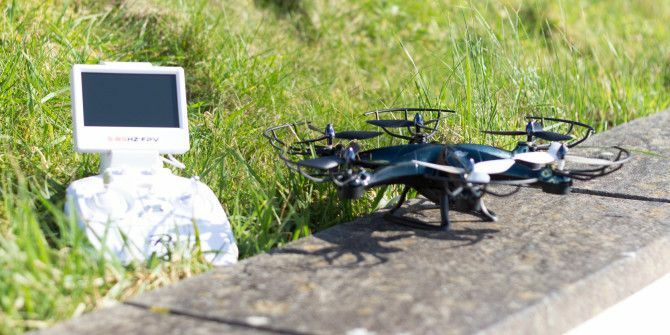 Read More drone batteries, and those proprietary spare batteries cost about $25 each – so which represents better value for money? The controller itself uses 4 standard AA batteries. With the screen connected, you get about 5-10 flights before those will need replacing too (so you better get some rechargeables). The screen can be detached from the controller, which will extend its life. Is This The Drone You’re Looking For? It would be unfair to compare the LiDi L6F to something like a Parrot Bebop or DJi, as those are many times the price. The camera quality on the LiDi is passable – perfectly fine for flying FPV mode, and fun to watch later as you soar through the skies (or crash, we won’t judge). What we have here isn’t quite a toy either: it’s a budget to mid-range beginner drone, and as such, makes a perfect first drone or even next drone if you’ve already played with some of the tiny Syma toys Syma X5C Quadcopter Review and Giveaway Syma X5C Quadcopter Review and Giveaway If you've any interest in drones but have been put off by the steep prices, buy the Syma X5C. It's a hell of a lot of drone, and just as much fun. Read More . The value proposition is great: even if the price jumps back to $200 odd after the sale, you’re still getting an HD camera, a physical controller with LCD screen for First Person View flying, and a fairly rugged hexacopter. Grab yours now from GearBest.com for $85 for a limited time. Explore more about: Drone Technology, MakeUseOf Giveaway, Toys. Cool.. this is exactly the drone i was looking for. You can turn it over to me now. Super one...and your app is is super....??? Yet another company that won't allow my email domain (xoxy.net), presumably because it supports disposable email addresses, even though 'make use of' is on a permanent white-list. Sigh. Time to remove them from the white-list I guess. Looks like you're referring to the Gleam competition entry widget. Nothing to do with us I'm afraid, as you can see you're still able to comment here. Probably your mail domain is being abused by too many people. to own a drone of this quality. Sorry am I "Droning" on a bit. This is a net drone - I would love to fly it & photograph the area where I grew up - about 60 acres of woods with clearings, torn-down log cabin & stone fireplace, an old well - the place of my childhood, where I searched & found Indian arrowheads etc...there is a stream - pretty much untouched since the mid sixties. Hope my entry gets picked! whoops - meant to say 'neat' drone! Am I first, cool. Can I be the only comment?